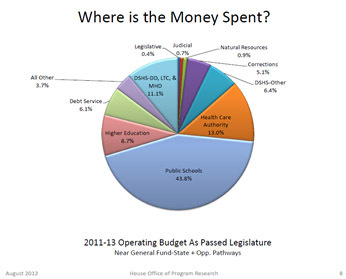 In 2013 the Legislature has three big budget problems to address. It may be that there are other issues for the Legislature (gun safety, mental health, transportation…) but as the budget chair I have an odd focus on what I’m responsible for. 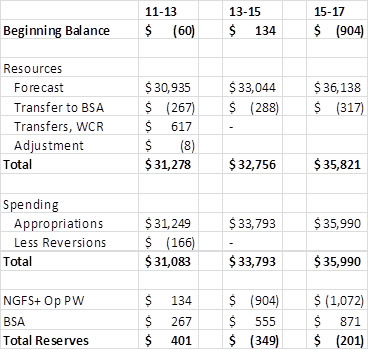 Balance the 2013-15 budget, plus make sure that the 2015-17 budget is structurally sound. We start with a $904 million shortfall and have to address the two issues below, plus comply with the strongest 4-year balanced budget requirement in the nation. The Supreme Court’s 2012 McCleary decision has major impact on school funding decisions and adds $1.4 billion to the already difficult problem. The Medicaid expansion called for by the federal Affordable Care Act (ACA) is complex, but provides us with the opportunity to cover hundreds of thousands of Washington citizens and save hundreds of millions. Implementation decisions will be difficult given the campaign rhetoric, but I believe we will get there. The political situation in the state Senate will make resolution more interesting and create a lot of political theater. I look forward to negotiating a rational solution. For a printable version of this post click here. It’s useful to know how we calculate this problem statement and what it includes and what it doesn’t. Constitutional requirements like debt service and continuing K-12 basic education funding. For example, we expect 8,170 new students in K12. Programs where eligibility is set in law, either state or federal. This includes Medicaid, Temporary Aid to Needy Families (TANF) and programs like food stamps. New Medicaid patients. Coverage for the aged, blind, and disabled populations, as well as specific low-income populations is set by the federal government. We expect there to be more than 100,000 new people to become eligible based on federal rules. Pension contributions to keep our pension program stable. Funding continuing programs like the college scholarships or our mental health system at the same level as the previous year. The following are excluded, and would have to be added to the budget if we want to do them, making the problem more difficult. Any growth in higher education to keep up with population growth or inflation. Any changes to employee compensation that must be approved by the legislature. Compliance with the McCleary decision on education funding or other lawsuits. Why Does The Budget Go Up Every Year? The answer is that costs go up too. It’s worthwhile to look at this in a little more detail. 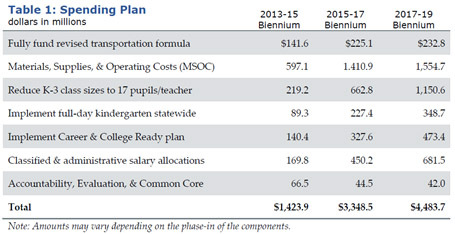 The chart to the right shows the top-level components of the increase, the biggest of which is the K-12 budget, which goes up by $982,938 million without even addressing the McCleary problem. We made temporary reductions in the 2011-13 budget to teacher salaries. Restoring them costs $166 million. We made some one-time cuts in spending. Restoring them costs $126 million. 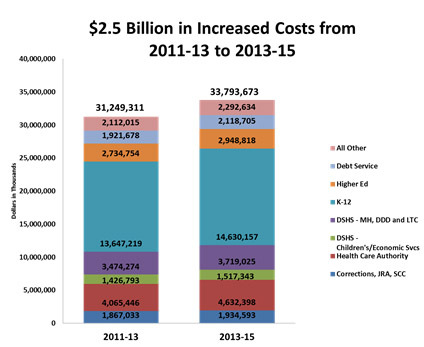 8,170 more students drive additional costs. This amount does NOT include McCleary funding. There are similar increases in other parts of the budget. Even without doing the Medicaid expansion there are 106,295 new people eligible for healthcare based on rules set by the federal government. As you might imagine this will be profoundly expensive. Our debt service obligation increases for currently funded projects by $197 million. This does not include debt service on any new investments like school construction for all-day kindergarten, new college buildings, etc.) we might make, which we typically do. Looking at some of the things not included in our budget growth model is also interesting. In higher education we do not automatically assume any increases in enrollment, even though population growth continues, nor do we assume any increases in scholarships to keep up with tuition increases the universities are planning. In addition, the “College Bound Scholarship” program has created a promise for low-income kids that we are not (yet) projecting. 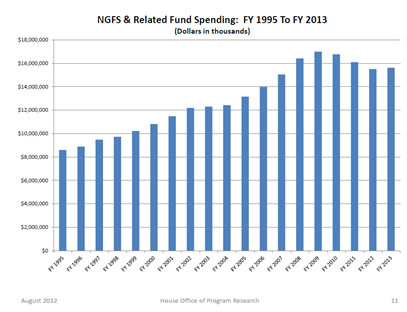 The chart to the right shows state spending from 1995 to 2013. You can see the big spike in 2009 and the shrinkage since. Even in the bad recession in the beginning of the last decade we didn’t see an actual decline in state spending. This doesn’t tell the whole story. Washington has added over 2 million residents since 1990, and they all need driver’s licenses and other state services. The blue (top) line in the chart below shows state spending per state resident since 1995. The red (middle) line shows that same spending adjusted for inflation, using the “implicit price deflator,” (IPD) an inflation adjustment often used in government work. The green (bottom) line shows the same data using the consumer price index for the Seattle metropolitan area. Using the inflation-adjusted (“real”) numbers, we are spending less today per state resident than we were in 1995. The third major decision the Legislature faces this year is how to respond to the federal Affordable Care Act (ACA) and a potential Medicaid expansion to cover about another 400,000 people, paid for largely with federal dollars. The table to the right lays out the changes we expect in the medical assistance area. There will be impacts in other parts of the budget, but this is the biggest. 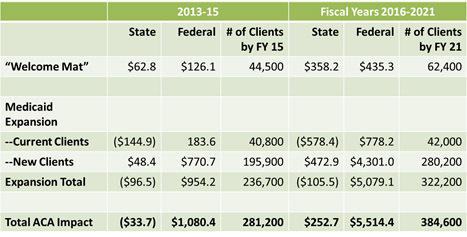 The bottom line is that if we adopt the Medicaid expansion we will save about $96 million in 2013-15 and another $105 million between 2016 and 2021. The final problem definition looks like this. It is possible to image scenarios that do not involve additional revenue, but difficult. 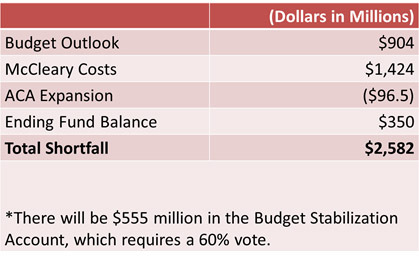 The Budget Stabilization Account requires a 60% vote to use, and we should probably leave it as a rainy day fund. The response to the budget problem can be looked at with some simple options. Do some combination of the two. Cutting expenses (but not the stuff that matters to the person proposing it) is always a popular option in the abstract. The reality of it is a little more difficult. The chart to the left shows the distribution of spending in the current budget. There are constraints on spending reduction that come from the state constitution and federal law that we have to think about when we consider this option. The “Public Schools” slice cannot legally be reduced. There is broad desire to not reduce our investment in higher education. To reduce our corrections expense we would have to release enough existing offenders to close a prison and/or end our parole operation. The “Health Care Authority” and “DSHS-DD, LTC, and MHD” expense are controlled largely by the federal government’s Medicaid rules. Very little can be reduced. Debt service cannot be reduced. The constitution requires us to pay debts legally incurred. My recommendation will be to choose option 3 – a mix of spending reductions and new revenue. Some reductions are poor choices for the state. For example reducing higher education results in less opportunity for Washington State children and fewer potential employees for businesses. Reducing mental health funding creates obvious additional risk to the public. I’ll write more as we move through the session on the specific spending reduction options in each area of the budget and possible revenue sources. 1 Comment on "Budget Outline 2013-15"
Thank you for your email response to my inquiry about internet poker. As a Washingtonian, maintaining an education budget is a top priority for the future of our great state. I would agree that education and mental health budgets should not be cut, as we can plainly see from recent events that these areas are necessary. I feel that one way to bridge the gap in the state budget is through the legalization and regulation of online poker, as a game of skill, raising much needed revenue without much cost. I look forward to seeing your proposals on the budget of our state.